If this isn't enough 'food for thought' in isolating drivers from passengers while buses are in motion, I don't know what is! 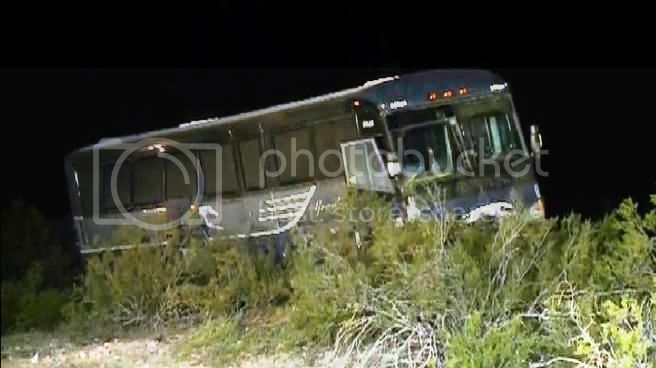 A passenger attacked the driver of a Greyhound bus early Thursday as it traveled down an Arizona highway, causing the bus to swerve and throw passengers from their seats before it went off the road, injuring 24 people, authorities said. The Dallas-bound bus was heading east from Los Angeles on Interstate 10 when it wrecked shortly before 2 a.m. near the community of Tonopah, about 50 miles west of Phoenix. One of the passengers "basically went berserk in the bus and grabbed control of vehicle," Harquahala Fire District Chief Dan Caudle told KPHO-TV. The bus crossed the highway median but came to a stop before entering westbound traffic when other passengers restrained the 25-year-old California man, the Arizona Department of Public Safety said. "The passengers descended on him," DPS spokesman Bart Graves told The Associated Press. The driver "did a good job of maintaining control" before the bus came to a stop in the median, where there were numerous rocks and bushes, Caudle told the station. Susana Ordinola, 48, of San Bernardino, Calif., said she heard other passengers complain to the driver about Morris during a stop in Blythe, Calif. She then saw the driver talk to him. Ordinola said she was sitting right behind the driver and saw Morris grab the steering wheel. The bus then started swerving. She said people were thrown from their seats. When the bus came to a stop, she saw people bleeding and screaming in pain. "Everybody is jumping and flying and screaming," Ordinola said while waiting for a bus back to California. Graves said the attacker reportedly was hallucinating and indicated he wanted to get off the bus. The man was taken to a hospital for a drug-induced condition, Graves said. The passengers' injuries included a broken sternum suffered by one person who helped restrain the attacker, said Officer Carrick Cook, another DPS spokesman. Morris and a female companion got off the bus when it stopped after the attack, and they ran off into the desert, the DPS said. They returned about 30 minutes later. When other passengers spotted the Morris returning, they started cursing at him and yelling "That's the guy," Ordinola said. Some threw rocks at him. According to Ordinola, Morris' companion tried to shield him before paramedics stepped in to stop people from going after Morris. Morris was arrested at the scene and transported to a hospital. He will be booked into jail on suspicion of numerous counts of endangerment, assault and aggravated assault, the DPS said. Morris does not yet have an attorney. Greyhound spokeswoman Alexandra Pedrini said the bus was carrying 41 passengers, plus the driver. A relief bus was sent to the accident scene to take the nearly 20 uninjured passengers to Phoenix so they could continue to their final destinations, she said. Ordinola, who had pain in her knees and a rib, was treated at a Phoenix hospital. I've had some rowdy passengers in my time but never one that attacked me. What a horrible position to be put in. What a horror story....lucky it didn't turn into a more serious tragedy.